Replace your failing (or about to fail) DPF unit with one of BC Diesel's serviceable DPF kits for your 2008-2009 6.7L Dodge Cummins 2500/3500 (which have a double support hangar). A $300 refundable core charge applies. 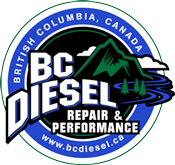 Replace your failing (or about to fail) DPF unit with one of BC Diesel's serviceable DPF kits for your 2010 - 2012 6.7 Dodge Cummins 2500/3500 (which have a single support hangar). A $300 refundable core charge applies. Replace your failing (or about to fail) DPF unit with one of BC Diesel's serviceable DPF kits for your 2008-2010 Ford Powerstroke 6.4L F250-F550 diesel. A $300 refundable core charge applies.